Our Greens 4 is bursting with essential vitamins and minerals including iron and magnesium and provides the body with an instant nutrient hit. One of the greener tasting juices in our range, the Greens 4 recipe incorporates lemon, which not only helps cut through the green flavour, but also offers a tangy and refreshing taste for your palate. 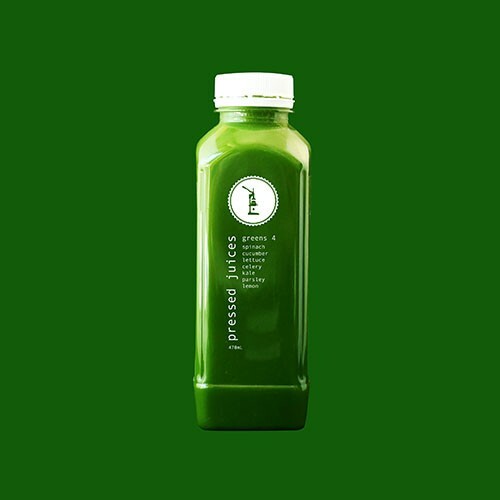 A must try for anyone seeking a good, honest green juice. Thanks to the assistance of kale, spinach, lettuce and parsley in Greens 4, our natural detoxification pathways are greatly assisted in processing toxins, whilst the cucumber, celery and lemon provide a gentle ‘alkalising’ effect, helping to balance out the pH levels in the body. If you’re looking to steer clear of sugar and want to flood your body with a nutrient dense juice, then look no further. Greens 4 contains only 6.2g of natural sugars, making it a great option to include in your daily routine.